The University of Chicago Medicine offers comprehensive care for high-risk pregnancies, engaging experts in obstetric anesthesia, neurology, neurosurgery, pediatric cardiology, pediatric cardiac surgery, general pediatric surgery, pediatric otolaryngology, neonatology, endocrinology, genetics and other specialties as needed. Through collaborative discussion, our dedicated experts reach consensus on best practices and risk management strategies in even the most challenging obstetrical cases. Our experienced team provides a wide range of expertise in the treatment and management of maternal and fetal conditions. 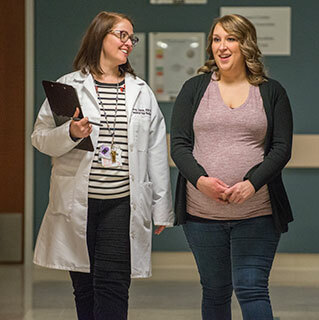 University of Chicago Medicine specialists are available for consultations to offer clinical insights and guidance for women who are pregnant or planning to conceive. Our team will engage in communication with your primary obstetric provider to support the best possible patient care experience and outcome for you and your baby. At the Family Birth Center, our state-of-the-art facilities are equipped with sophisticated imaging technology to support definitive diagnosis for congenital disorders. Our team of highly skilled specialists brings together more than 150 years of collective experience. We also offer biophysical profile (BPP) testing, which includes nonstress testing (NST) and ultrasound imaging to assess fetal health, usually during the last trimester. We offer comprehensive care and treatment services for a broad range of high-risk pregnancy conditions. Our experts also perform complex surgical techniques for the treatment of certain high-risk pregnancy conditions, including cervical cerclage for incompetent cervix and radical vaginal trachelectomy (cervicectomy) for cervical cancer. Our Fetal and Neonatal Care Center provides personalized prenatal consultations and the highest level of specialized care for babies facing critical health challenges. How can fathers bond with their newborns?